The Samsung NX58F5500SS Oven: Is It The Right Oven For You? 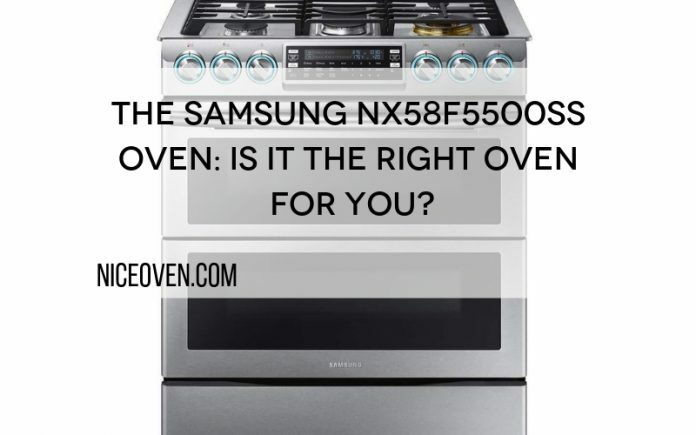 Home Nice Ovens The Samsung NX58F5500SS Oven: Is It The Right Oven For You? Do you cook bacon in the oven or on a pan? I’m a pan man myself. The Samsung NX58FF5500SS lets you do it both ways. You can make all of your favorite foods in this oven. Freestanding gas ranges are convenient, especially for summer houses and off-grid cabins. 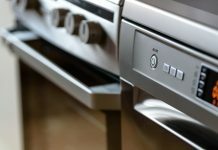 Gas cooktops are a joy to use, but I’ve often struggled with the ovens of affordable gas ranges. 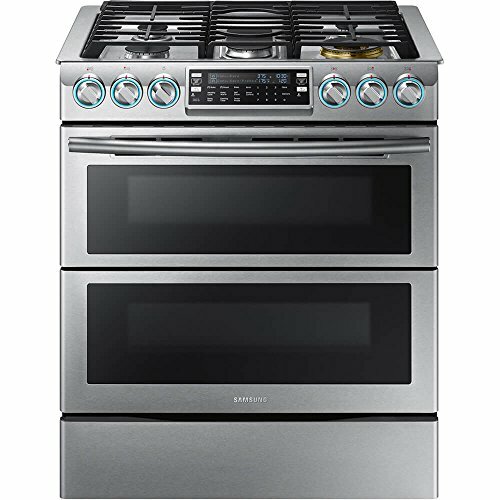 So, is the Samsung oven as expensive as others? If not, is it as good? The Samsung NX58F5500SS is a versatile 5.8cu gas range with five burners. Its large size and capacity let you cook multiple dishes at the same time. For example, if you want to make a few different casseroles or pastries at once. And you’ll never have to worry about a big roast or turkey fitting inside the NX58FF5500SS. The range top is about as allowing as the oven, with five different burners of different sizes and intensities. So you can cook a full dinner with sides and sauces all at once. Samsung’s NX58F5500SS is a fairly standard gas range when it comes to features. Nothing stands out too much in this price range.The controls cover all the basics and a little bit more. You get a knob for each burner and an interface with buttons for the oven. There are quick presets for baking, broiling, and keeping food warm. You also get special shortcuts for pizza, chicken nuggets, and bread. While oddly specific for some, you’ll love these settings if you cook a lot of those foods. There’s a “favorite cook” button that lets you store your favorite combinations of temperatures and cooking times for easy, consistent cooking just the way you want it. Last but not least, there’s the self-clean button. This runs a cleaning program that uses extreme heat to eliminate grime and residue inside the NX58F5500SS oven. The whole range seems designed for easy cleaning. You can remove the burner knobs for easy cleaning, although they’re not dishwasher safe. The oven is the heart of the NX58F5500SS gas range. It preheats very fast for a gas stove. You can expect it to get up to 350F in about five minutes. It’s a single-cavity oven that’s 25-inches wide, just above 25-inches high, and 19-inches deep. The two included oven racks let you make good use of all that space, and there are seven different positions for them. Not everything is all sunshine and roses with this oven though. The NX58F5500SS oven is a bit inaccurate when it comes to temperature. The temperature drops a bit when you put food in, and it may go up and down a bit as you bake. You won’t have to worry about overheating and burning your food though. It can, however, be a bit inconsistent at times. That is kind of expected from a gas range like this though. There will be slight heat inconsistencies, and the temperature varies a bit throughout the oven cavity. So if you’re cooking up a big batch of small things, let’s say cookies, you’ll want to shift them around a bit during the cooking process. ​ When it comes to performance, it’s pretty typical for a gas range top. If you’re used to electric stoves, you may find that the minimum and maximum temperatures aren’t as high. But if you’re moving on from an older gas stove, you’ll be pleasantly surprised. The primary burner, on the left side toward the front, is the most intense one. This is the one you’ll want to use for searing a steak and boiling things. You can expect your pasta water to boil within five minutes. The simmer burner in the opposite corner is good when you need lower temperatures, for simmering food or melting butter for a sauce. Its minimum is pretty low for a gas range. Most important is the big oval burner in the middle. It's a great feature that’s very helpful when you want to cook with a big pot or a long dish. It supplies sufficient heat for a big cook, and it even comes with a special griddle pan. The griddle pan is ideal for eggs, burgers, and bacon. 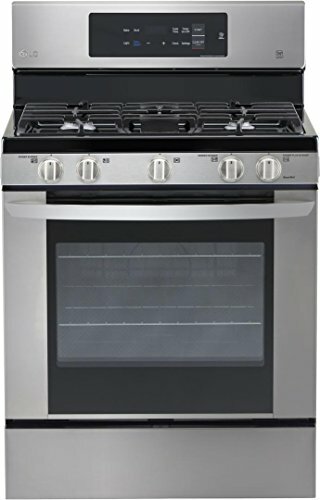 The NX58F5500SS gas range has a 3.0 out of 5-star rating on Amazon. People report that it’s quick to heat up, and the range top is good, but the oven is a bit inconsistent. Its price is in the lower mid-range for this category of gas stoves. To find one, you can use the official store locator. We’ve analyzed and compared many customer reviews from Consumer Reports, retailers, and manufacturer sites. We’ve also rounded up key specifications for easy comparison. To get a better overview of how the NX58F5500SS performs, we’ll now provide comparisons to a few other similar gas ranges. Namely the GE JGB700SEJSS, the LG LRG3061ST, and the Whirlpool WFG540H0ES. The Whirlpool WFG540ES has an overall design that’s very similar to the Samsung NX58F5500SS. It’s got five burners and a 5.8cu oven at a competitive price. And it comes in five different colors. 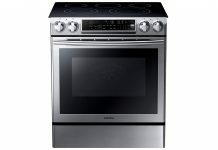 This is a convection oven, so it has a fan that helps provide a more even distribution of heat inside the oven cavity. So it’s better for baking, which can be hard with many gas ranges. It can reach up to 550 degrees Fahrenheit (F), which is pretty good for a gas oven in this price range. Just like the NX58F5500SS, it comes with two oven racks that fit into seven different positions. These are wire racks, and there’s no gliding rack. There’s also no proofing mode for raising dough, although that’s more of a gimmick feature. It also features a self-clean cycle like the NX58F5500SS. So you won’t have to spend much time cleaning out the oven. But instead of disintegrating the dirt with heat, it uses steam to dissolve it, which means it won’t fill your kitchen with smoke while self-cleaning. There’s a convenient storage drawer under the main cavity, rather than a warming drawer. Another plus is that the range has a control lock to keep kids and pets from accidentally turning the burners on or causing a gas hazard. It has five burners like the NX58F5500SS, but the middle one is a standard round burner like the rest. And it doesn’t come with a griddle built into the range top. There are two midrange burners, a simmer burner, and two hot burners. The front-left SpeedHeat burner is the hottest, reaching up to 17,000 Btu. The whole cooktop has a cover of porcelain-coated steel. Its full-width grates consist of porcelain-coated cast iron. These grates are easy to remove, and they can handle a dishwasher. All burners are sealed so you won’t spill anything beyond the surface. So it’s effortless to clean the whole range top. A nice-looking stove with an even prettier price tag. 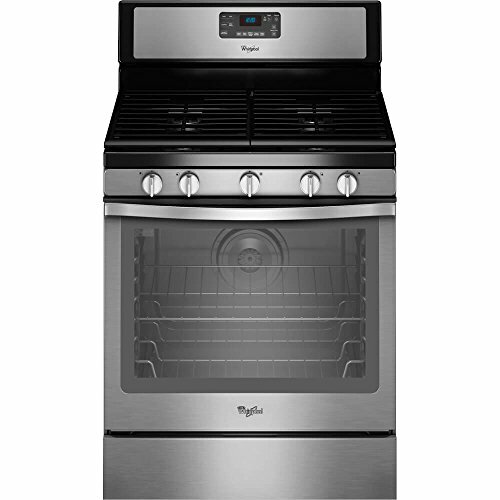 It offers five burners plus a built-in griddle, a warming drawer, and continuous cooking grates. The oven promises goo baking and boiling capabilities. Let’s see how well it delivers. Probably the first thing you’ll notice is the blue interior which becomes very vibrant when lit up. While it’s only a visual feature, looks do count. The oven cavity is a bit smaller than that of the NX58F5500SS but still sizable. So it’s good for a roast or a party-size batch of cookies. The oven lacks LG’s ProBake system and has no fan at all, so there will be noticeable hot and cold spots throughout the cavity. Again, this is normal for basic gas ovens. Other than that, it has two racks and seven positions for them. The controls for the oven are similar to the ones on the NX58F5500SS but with fewer presets. You get shortcuts for broil, bake, timed cook, and delay clean. The EasyClean system is semi-self-cleaning. You spray some water on all the inside surfaces and run the clean cycle, then wipe it off. This model has the hottest front burner on the right side. With its 17,000 BTU max heat, it’s great for fast boiling and searing. The one to the left is a bit milder, and the one behind that even more so. The right rear burner is the low-heat one. You get an oval middle burner which gets up to 8,000 BTU. It has the standard porcelain finish for easy cleaning. The range also comes with a griddle plate. 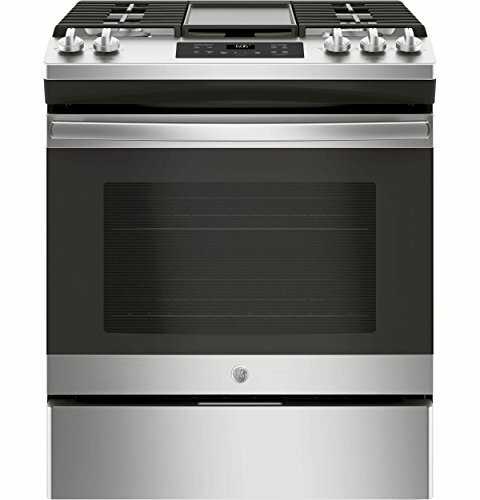 GE Appliances are successful in the budget-friendly gas range category. This one is a bit pricier than the Nx58FF5500SS and other ranges listed but still affordable. And it has some nifty bonus features. The cavity isn’t as big as the one on the Nx58FF5500SS, but it’s roomy enough for most uses. It performs better, being a convection oven, although you may still encounter slight problems with uneven finishes on large batches of cookies and such. It has a pretty good broiler and two racks for seven positions. What warrants the higher price is the electronics situation. It features a control lock and a digital clock in addition to the usual timer and heat controls. The control panel is a touch screen which also offers a generous selection of presets. Another nice feature is the preheat signal which is loud and clear enough for a busy kitchen. It’s also Bluetooth compatible. You can turn on the light and fan and connect it to an LG microwave. A bit of a gimmick feature, but nice for tech lovers. You get four normal burners and an oval middle burner. It comes with a reversible non-stick griddle pan for the oval burner, which is ideal for burgers and big breakfasts. The range of minimum and maximum range isn’t that vast, but good enough for all common needs. The main burner and Power Boil burner in the front both max out at 15,000 BTU. The right-rear simmer burner comes in at 9,500. So it’s not the fastest range top, but it’s reliable. 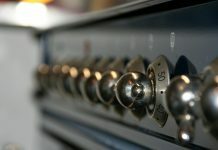 It has continuous cast iron grates and control knobs in stainless steel. The whole top has a nice coating for easy cleaning. Overall, the Samsung Nx85F5500SS is a decent freestanding gas range. ​ It’s nothing special, but a solid option for ordinary cooking. Thanks to its large capacity and good burners, the Nx58FF5500SS is an excellent option for those who don’t use the oven all that often. As such, we support Amazon customers 3 out of 5-star rating. Next articleFrigidaire FGGF3058RF: Feature-Packed, But Is It Better? The History of Ovens: How Have They Evolved Through Time? Disclaimer: Nice Oven may receive financial compensations from some of the links to products or services on this website. Frigidaire FGGF3058RF: Feature-Packed, But Is It Better?